The structure of this particular tome is not a departure from what has come before. At the beginning: a few excellent essays - including a characteristically thought-provoking appraisal of the current state of the industry - followed by FAQs. At the end: a glossary, indices and some Top Tens. And of course, in the middle, hundreds of juicy reviews of new and new-ish fragrance releases. In other words: business as usual. But that’s precisely why this release should be welcomed with scented arms. Ten years ago, the world of perfume criticism was a very different place. It needed the efforts of people like Turin and Sanchez to legitimise it and place it within the wider context of the work of creators and retailers. Nowadays, perfume reviewers are hardly a novelty. But their integrity is open to question. At a time when both social media and brands are conspiring to persuade follower-hungry ‘influencers’ (has there ever been a more asinine word?) to paste a gelatinous gloop of positivity over every single product, the value of criticism is in serious danger of being compromised. Turin and Sanchez have returned at just the right time to prove that truthfulness - no matter how subjective it may be - is always going to be more helpful and more constructive in the long run than some inane copy-pasting of a nonsensical press release. Of course, the precise contents of that truthfulness are up for discussion. Thank goodness! After all, that is the main purpose of criticism. On the one and only occasion - thus far - that I’ve met him, Turin said that one of his favourite books is James Carse’s Finite & Infinite Games, because it celebrates the unending pursuit of knowledge, the denial of all-conclusive answers, the refusal to bring the game to an end. Contrary to what some seem to think, his and Sanchez’s reviews are not an attempt to have the final say on their subject. If they’re written in a manner that appears to brook no further argument, that’s mainly a reflection of the craftsmanship of their authors. But in fact what they are is an invitation to further the debate: not on the level of some Insta-pouter, but of someone who’d like to make at least an attempt to treat the matter with a modicum of intelligence. So even though I don’t agree with all their reviews, I am so grateful to them for giving me the opportunity to consider and revise my own positions, as well as those of others. Perhaps some of their put-downs tip into the over-personal. Maybe their love of certain perfumers is a touch too unshakable. Possibly their continued use of star ratings is reductive. But that’s all up for debate. And how wonderful to be able to debate a feast as rich and multi-layered as this. Like a High Tea chat between the ghosts of Wilde and Wodehouse, their reviews gleam with wit, conciseness and, crucially, the ability to connect seemingly disparate dots. By and large, they are an utter joy to read. I’m concerned about the pair’s intention to release a new volume every year - I’d say part of their strength lies in viewing the scented scene from a less immediate vantage point - but I would certainly prefer to have an annual entry rather than none. Long may T&S keep writing. And giving us those ‘not gardenias’. PS Please stay tuned for details of a very special episode of Love At First Scent celebrating the 190th anniversary of Guerlain. Ok, The Guide 2018 is great. 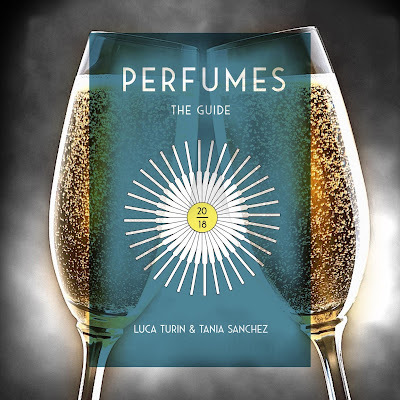 The original guide had LT/TS planting the seed in so many minds that they could create a niche perfumery business and like some Stephen King Horror character they now come along and strike that belief down: "He who walks behind the rows" [of perfume bottle]. Overall as scintillating as the original guide. Some recycled material from Style Arabia and Turin's blog, but that's ok. One thing though- this is not The Guide 2018. The original Guide definitely deserved that definite article. This is A Guide to perfume of particular years: it is not a guide to Perfume as presently available. A more expanded title that lays clear the remit of this book would be better. An actual as exhaustive as you can reasonably get Guide from LT and TS would desirable; but I understand the influence of their own first Guide may have made that a crazy task. My only major disagreement with them: De Profundis is not a one star scent. Anon, I guess that's a fair enough point, although I suppose their introductory text makes the intention of the book fairly clear. I look forward to meeting Turin tomorrow when he appears at my local fragrance boutique. Oh, how wonderful. Let me know how the meeting went!